When designing, building or even remodeling a home to be very energy efficient, much time is spent on the building envelope, electrical systems, and appliances. But did you know that exterior landscaping can affect the energy performance of your home? A well designed and energy efficient landscape can reduce your heating, cooling and lighting costs. In certain circumstances, carefully positioned trees and shrubs can save up to 25% of the energy a typical household uses. Energy efficient landscaping has additional benefits such as lower maintenance costs, a reduction in water use, a quieter home and cleaner air. An energy efficient landscape looks different depending on where you live. A desert home in Arizona will obviously be different than a home in upstate New York or Seattle. It pays to do ample research on your region before you begin planning your landscape. Plant deciduous trees on the south and west side of the house to maximize sun in the winter and shade in the summer. Deflect winter winds by planting windbreak appropriate trees and shrubs on the north and northwest sides of the house. Attract summer breezes towards the home by knowing where the summer evening breezes come from and channeling them towards the house. Provide as much shade as possible to cool roofs, walls, and windows. For non-air conditioned homes, allow summer winds to access your home. For air-conditioned homes, block or defect summer winds from your home. 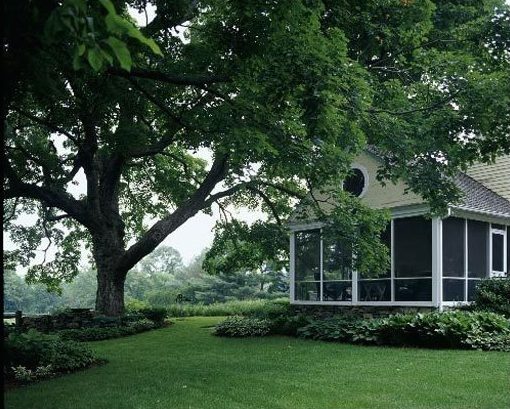 Maximize summer shade with trees that will also allow penetration of low-angle winter sun. Channel summer breezes (if existent) towards the home. Avoid excess plants or shrubs close to the home, especially if they require a lot of water. This can create more humid microclimates next to your house. Plant dense windbreaks on the windward side to protect the home from cold winter winds. Prioritize the winter sun reaching south facing windows in the winter by not having plants on that side, or planting open deciduous trees and shrubs. If summer overheating is an issue, shade the south and west windows from the sun in the summer (again, with deciduous plants). If you have a solar photovoltaic system on your roof, always be sure that trees and plants won’t block the sun from your roof—even in 20 years! Microclimates are local zones that differ from a surrounding area. A microclimate can be as large as several square miles or as small as a few square feet. 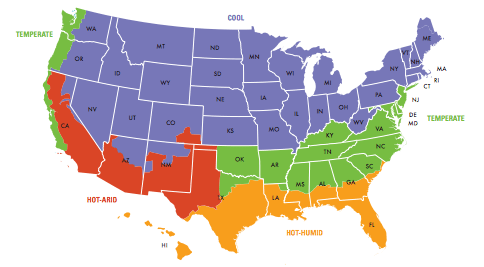 Your home’s microclimate can vary from your neighbor’s microclimate just a few blocks away. Microclimates are often created by changes in elevation, slope, aspect or surface. For instance, a cooler microclimate can exist near a body of water such as a river or pond. 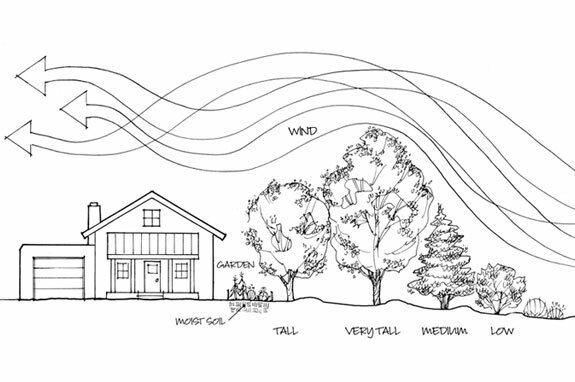 Knowing your home and property’s microclimates can be very helpful when designing your landscape. In cold, windy regions, windbreaks can reduce your heating costs by lowering the wind chill near your home. When planted properly, a good windbreak can reduce the wind speed for a distance of as much as 30 times the windbreak’s height. The best windbreaks block wind close to the ground by using trees or shrubs that are dense throughout the height of the plant. You can also use a combination of trees, shrubs, bushes and berms to create an effective windbreak. Windbreaks also help reduce noise, sights or smells as well as create wildlife habitat. Proper shading can reduce cooling costs in warm summer regions, but may not be needed in temperate or cool regions where summer overheating isn’t an issue. To plant for shade effectively, you need to know the size, shape and location of the shadow at different seasons and different times of the day. In most cases, if you plant a 6-8 foot deciduous tree near your home, it will start shading your windows in the first year, and your roof in 5-10 years. Keep in mind that vines, shrubs and bushes can effectively shade walls and windows and may be enough in certain regions. In more northern climates and cooler areas, the primary goal may be to allow the sun to penetrate the southern portions of the home in the winter. Radiant heat and natural daylight can help save in heating and lighting costs. If there is no concern over winter winds from the south, you may not need any trees or shrubs on the south sides of the home. Like any type of landscaping, be sure to research your local region and seek help from your county extension, local nurseries, professional landscapers and other resources. Landscaping is an investment in your home and property as well as a potential investment in energy savings!